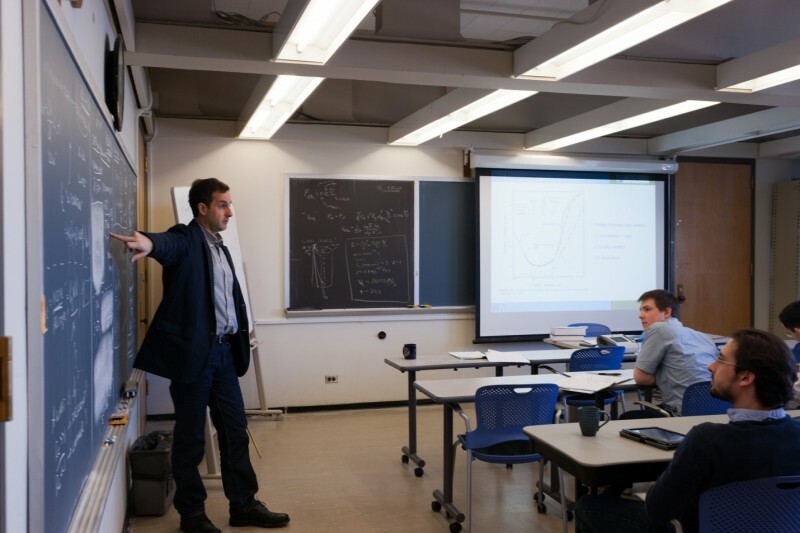 MIT offers one of the most comprehensive and diverse graduate course offerings in atmospheric chemistry available. Class Listings follow. For more information about specific graduate course requirements, refer to departmental webpages. Provides a detailed overview of the chemical transformations that control the abundances of key trace species in the Earth’s atmosphere. Emphasizes the effects of human activity on air quality and climate. Topics include photochemistry, kinetics, and thermodynamics important to the chemistry of the atmosphere; stratospheric ozone depletion; oxidation chemistry of the troposphere; photochemical smog; aerosol chemistry; sources and sinks of greenhouse gases. The objective of this class is to explore how atmospheric chemical composition both drives and responds to climate, with a particular focus on feedbacks via the biosphere. Discussion topics include: atmospheric nitrogen; DMS, sulfate and CLAW; biogenic volatile organic compounds and secondary organic aerosol; wildfires and land use change; atmospheric methane and the oxidative capacity of the troposphere; air quality and climate and geoengineering. Introduction to the physics and chemistry of the atmosphere including experience with computer codes. Aerosols and theories of their formation, evolution, and removal. Gas and aerosol transport from urban to continental scales. Coupled models of radiation, transport, and chemistry. Solution of inverse problems to deduce emissions and removal rates. Emissions control technology and costs. Applications to air pollution and climate. Introduces scientific, economic, and ecological issues underlying the threat of global climate change, and the institutions engaged in negotiating an international response. Develops an integrated approach to analysis of climate change processes, and assessment of proposed policy measures, drawing on research and model development within the MIT Joint Program on the Science and Policy of Global Change. Graduate students are expected to explore the topic in greater depth through reading and individual research. Introduces the atmospheric chemistry involved in climate change, air pollution, and ozone depletion using a combination of interactive laboratory and field studies and simple computer models. Uses instruments for trace gas and aerosol measurements and methods for inferring fundamental information from these measurements. Provides instruction and practice in written and oral communication. Students taking the graduate version complete different assignments. Focuses on understanding how aerosol particles form droplets or ice crystals during several atmospheric processes, such as: determining Earth’s radiative balance, heterogeneous chemistry and acid rain, and understanding where, when and how much precipitation occurs. Provides tools for understanding: the physics of aerosol and cloud element motion, the interaction of particles with water vapor including phase changes and droplet and ice nucleation, the chemical composition of particles and the effect on cloud formation processes, and the effect of cloud processing on aerosol chemistry. Relevant topics of contemporary interest, for example geoengineering and weather modification and volcanic effects, are discussed. Stresses integration of central scientific concepts in environmental science and their connections to societal actions. Places emphasis on identifying and intercomparing the scientific foundation of environmental problems and proposals for their solution. Through lectures, independent study, group discussions, and periodic research reports, students produce an in-depth overview and critique of case studies in environmental problems and human actions. Illuminates commonalities and differences between past and present successes and impediments in dealing with environmental decisions. Potential topics include ozone depletion, global warming, acid rain, and smog. Students taking the graduate version complete different assignments. Subject addresses environmental challenges facing transportation in the 21st century, focusing on climate change and air quality. Covers air, sea, road and rail transportation and associated environmental impacts. The fundamentals of combustion and emissions are introduced. Impacts of transportation emissions on atmospheric composition from local to global scales as relevant to both climate change and human health are considered in-depth. This includes atmospheric dispersion, transport, chemistry, aerosols and radiation. Environmental impact metrics and environmental cost-benefit analysis techniques are discussed and illustrated with policy examples. Finally, alternative transportation fuels are introduced and assessed environmentally. Practical introduction to the international environmental political arena, particularly designed for science and engineering students whose work is potentially relevant to global environmental issues. Covers basic issues in international politics, such as negotiations, North-South conflict, implementation and compliance, and trade. Emphasizes the roles and responsibilities of experts providing scientific assessment reports and in technical advisory bodies. Term projects focus on organizing and presenting scientific information in ways relevant for ongoing global policymaking.